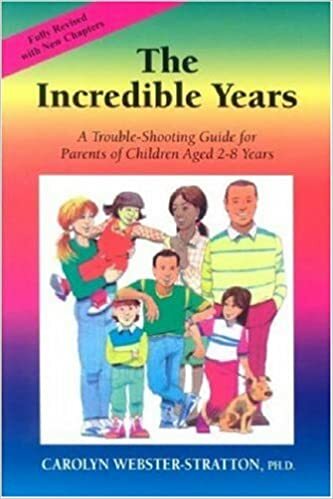 My family is currently enrolled in a session of The Incredible Years, which is an evidence-based program for parents and for children, supported by over 30 years of research. The goal is to prevent and treat young children’s behavior problems and promote their social, emotional, and academic competence. At the program we’re in, parents attend a 13 week session to learn skills to support their kids. Children attend 18 weeks of “Dinosaur School” which uses dinosaur-themed materials and puppets to engage children and strengthen social and emotional skills. Both programs are truly excellent! I will be doing a series of blog posts here where I reflect on things we are learning in class and in the book. Writing about ideas gives me a much stronger grasp of them, and a deeper understanding of how they can apply to my parenting life and to the information I give students in my parent education classes. Nothing I write here is meant to be a substitute for participating in these programs! The hands-on, in-person aspect is key to the learning. But hopefully you’ll find some interesting tidbits in these posts. Posts in this series: The Attention Principle, Ignoring Annoying Behavior, When/Then and If/Then, Parenting Pyramid, Consequences, Time Out. This entry was posted in Parenting Skills on October 27, 2017 by Janelle Durham. Sounds interesting. Is it more for the parents? It probably depends on the family. In our class, I have the impression that some parents are taking the class to improve their parenting skills, and it’s just handy that there’s a kids’ class at the same time. Other parents specifically sought out the class to help their child learn skills that they are struggling with, and the parent class is secondary to them, but helpful. I think the kids’ class is really helpful… if the child is challenged in social interactions with other kids, then individual sessions with an adult therapist would be nowhere near as effective as this class with a group of kids. This sounds really good, and important. Thanks! Please keep us updated on progress and what you learn. I’m a preschool teacher and, much of what I do is guiding parents.